Photos by Liz Martiniak © ©Liz Martiniak 2003; all rights reserved. Top: Castleton Farm cemetery. 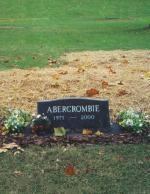 Bottom: Left--Marker listing horses buried; Right--Abercrombie. 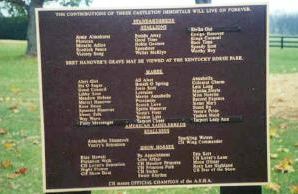 CASTLETON FARM near Lexington, Kentucky has had a long history as a nursery for both Thoroughbreds and Standardbreds. It reached its zenith as a Thoroughbred nursery under the ownership of James R. Keene at the beginning of the twentieth century, when Domino stood at stud, and luminaries such as Commando, Peter Pan, Black Toney, Maskette, and a host of others were foaled. 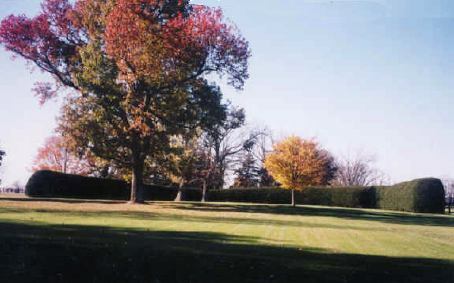 Acquired by David Look after Keene's death in 1913, it became a Standardbred farm, and was maintained as such when purchased by Frances Dodge Johnson in 1945. In 2001 the farm was sold again, and once again became a nursery for runners. Mares include MERRIE ANNABELLE, a world champion two-year-old filly who was injured in a freak accident at The Red Mile, and died despite heroic and lengthy efforts to save her life. Other mares include Hambletonian-winning filly YANKEE MAID and her champion daughter YANKEE LASS; champion mares PROXIMITY and COLONIAL CHARM; and TARPORT CHEER, one of the greatest pacing matrons of all time. --L.M.